Personal protective equipment (PPE) requirements are an important line of defense in arc flash safety. Arc flash PPE should feature head-to-toe protection against this serious hazard so you’re able to get the job done in the safest, most efficient and professional manner possible. Appropriate arc flash PPE requirements includes arc-resistant gear, voltage rated gloves and insulated tools to protect the entire body from the dangers of arc flash and shock hazards, including your skin, vision and hearing. An arc flash is the light and heat produced as part of an arc fault, a type of electrical explosion or discharge that results from a low-impedance connection through air to ground or another voltage phase in an electrical system. Electrical arcs experience negative incremental resistance, which causes the electrical resistance to decrease as the arc temperature increases. 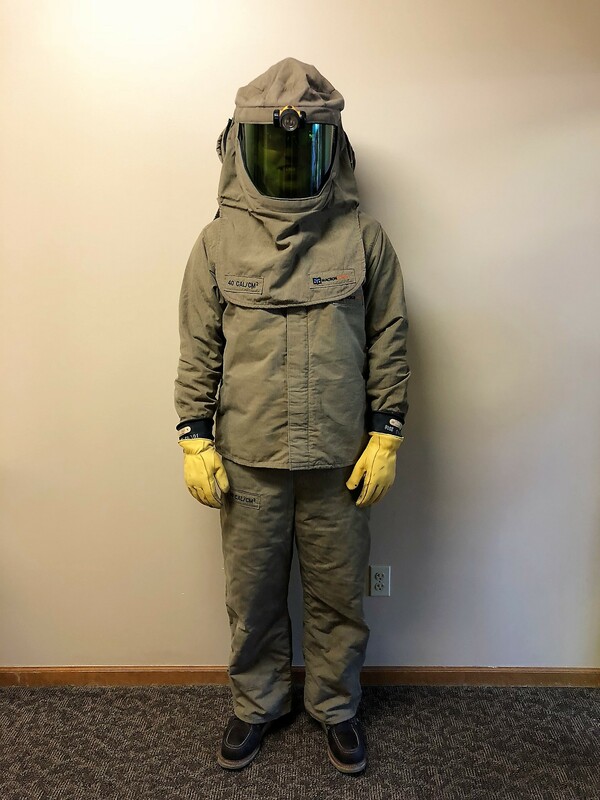 Determining the correct Arc Flash PPE requirements can be very challenging, but ESS is knowledgeable about determining the types of PPE needed. All PPE must now be classified as Arc Rated. Flame Resistant is no longer acceptable. OSHA 29 CFR Subpart V, “OSHA identified 99 accidents that involved burns from arcs from energized equipment faults or failures, resulting in 21 fatalities and 94 hospitalized injuries.” “Of the reports indicating the extent of the burn injury, 75 percent reported third-degree burns (id.). Proper protective equipment and clothing would reduce the number of fatalities and the severity of these injuries. ”OSHA’s review of the IMIS data also found that 75 percent of burn accidents resulted in third-degree burns to one or more of the victims. The Arc Thermal Performance Value is measured in calories as cal/cm2, and it’s defined as the maximum incident heat energy that a fabric can absorb. · For >1.2 to 12 cal/cm2, an arc-rated long-sleeved shirt and arc-rated pants or arc-rated overall or arc flash suit are PPE requirements. Also required are an arc-rated face shield and arc-rated balaclava or arc-rated flash suit hood, and an arc-rated jacket, parka, or rainwear. Other requirements include a hard hat with an arc-rated hard hat liner, safety glasses or goggles, hearing protection, heavy-duty leather gloves and leather footwear. For more information, call Electrical Safety Specialists at (816) 925-0443. For the last 25 years, several members of our leadership team have worked together developing relationships with various individuals that are all at the top of the electrical safety industry. Electrical Safety Specialists built a team of professionals to provide the highest quality of service available and recognizes the fact that each skill-set requires a lifetime commitment.